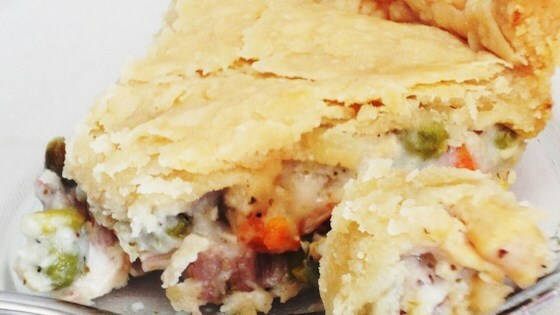 "Turkey pot pie like you have never tasted before. It won't last long." Place the peas and carrots, green beans, and celery into a saucepan; cover with water, bring to a boil, and simmer over medium-low heat until the celery is tender, about 8 minutes. Drain the vegetables in a colander set in the sink, and set aside. Bake in the preheated oven until the crusts are golden brown and the filling is bubbly, 30 to 35 minutes. If the crusts are browning too quickly, cover the pies with aluminum foil after about 15 minutes. Cool for 10 minutes before serving. I did not care for this recipe. Made it exactly like recipe except I made my own crust which was the only good thing about it. It didn't last long!! This was my first attempt at making a turkey pot pie and it was a success. It is an easy recipe to follow and oh so tasty.